Here are some pics I shot (with a bit o' Photoshop artwork) on my lunchbreak today. Chrysler graveyard / farm, Spinnerstown, PA, USA. Uhh... really? Where is it made? Korea? Thanks guys! I find beauty in 'junk'... rusted Americana, haha. Chrysler graveyard / farm, Spinnerstown, PA, USA. a bit of photoshop to balance out the purples and other colors. gsga's pics were down a little while earlier. I'm guessing whatever server was hosting them flaked out for a little bit, but they're fine now. Bakklandet, Trondheim.. some 14 hours ago..
A view of the cathedral.. a few hours ago..
That looks pretty wild, rising up through the trees! This is actually right in the middle of the city..
Nope.. I only cropped the pix. The colours are untouched. The light here is pretty special too. A walk in New York, last Wednesday night. Amazing NYC pics! Well, I am pretty much living in a village.. Yes, it's Big Money. Still, one of the nice things about taking the bus into town to go to Carnagie Hall is the walk through Times Square. It's a nice place to visit... Not as nice as Trondheim though. Thanks for the heads up guys. I upload to ImageShack, so I guess they were down at the time. Zyn: Love those light-trail type shots! Great colors. Elektro: Trondheim looks gorgeous. That one shot of just the village and that purple sky... "picture postcard". 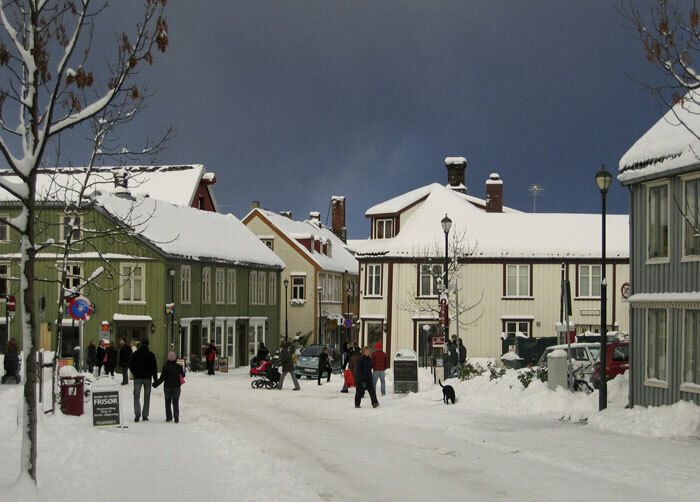 The great thing about Trondheim is, there are 150 000 inhabitants, but it's still a village. We walk slow, talk slow, act slow, but we're quick to laugh! That's a wonderful thing. And rare in this day and age. I would like to point out that my pictures of NYC have several shots of the NASDAQ building. The entire front of this building is a video display, except for holes to accomodate the windows. It's facinating. I've seen it in bright sunlight and it is very visible. At night it is very bright. See http://mosc.com/Slides/NYC-11-2004/IMG_1559.html and the next 4 pictures. Just wait for the cathedral at Tondheim to get this technology. 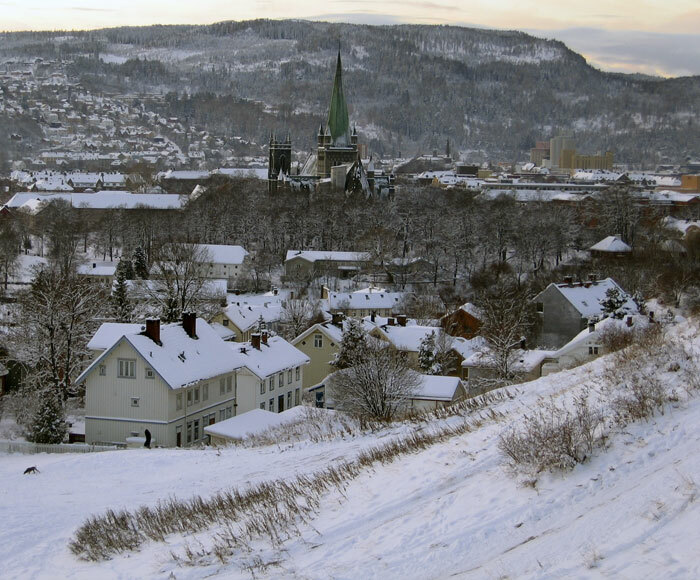 That'll certainly brighten up the Trondheim winters. Seriously, if the cathedral builders in the olden days would have had this technology I have no doubt they would have used it. The front of the cathedral is actually a giant advertisement display promoting the religion. There are scores of statues of church figures and saints. Here's a photo I snapped back in 2003. If you look carefully you'll see a solitary figure standing in front of the church. That is none other than Elektro80 himself.